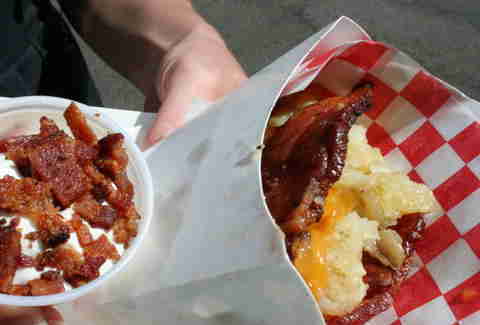 Three words in the English language cause people to sit up and take notice more than any others, and those three words are: bacon food truck. Also, I have herpes. 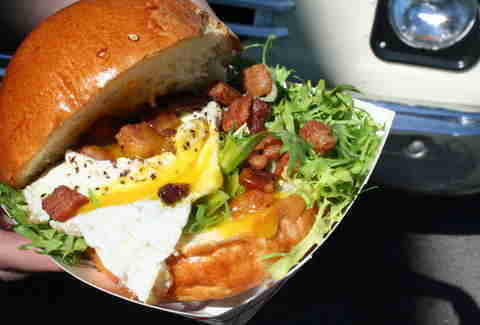 Behold the former, Lardon. Finally hitting the streets full time, Lardon's a rolling wagon dedicated solely to dishes made from deliciously sizzly porkiness, all from a married LA couple obsessed with pig, which is better than being obsessed with Big, though to be fair Billy Kopecki is pretty hilarious. 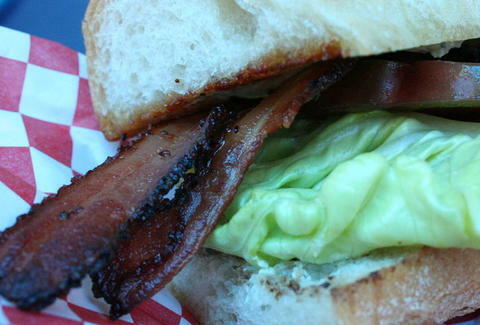 Glorious greasiness includes everything from upgraded basics like a BLT w/ Nueske's peppered bacon, butter lettuce, heirloom tomatoes, and St. Agur Blue Cheese on a baguette, to more-complicated dishes like a Frisee et Lardon sandwich w/ fried egg & bacon-fat vinaigrette on brioche, to insanity like the baco: a taco stuffed w/ potatoes and cheese w/ woven bacon replacing the usual tortilla, served w/ horseradish sour cream topped with pork, just to remind you that this isn't a horseradish sour cream truck, silly. Of course, they've also got breakfast (smoked bacon w/ over-easy eggs and cheddar on a soft roll; bacon-filled pancakes w/ bacon-infused bourbon maple syrup), dinner (chicken wings covered in bacon hot sauce, topped w/ bacon slices, w/ a bacon blue cheese dipping sauce), and even dessert, w/ bacon and nutella spread atop a Silver Lake Bakery brownie -- a solid call since Beverly Hills brownies just end up learning life lessons from Shelley Long. As far as side dishes, they've bypassed standards like french fries in favor of "The Bacone": three strips of specialty bacon that'll rotate weekly, forcing you to go back and say three other words that cause people to take notice: "Heart attack! 9-1-1!!"